The Tampa Bay Lightning have re-signed center Adam Hall to a one-year, one-way contract today, vice president and general manager Steve Yzerman announced. "We are pleased to have Adam return to the Lightning for another season,” Yzerman said. “His outstanding work ethic and leadership were, and will continue to be, very important to us." Hall, 6-foot-3, 213 pounds, played in all 82 games with the Lightning last season, recording seven goals and 18 points. 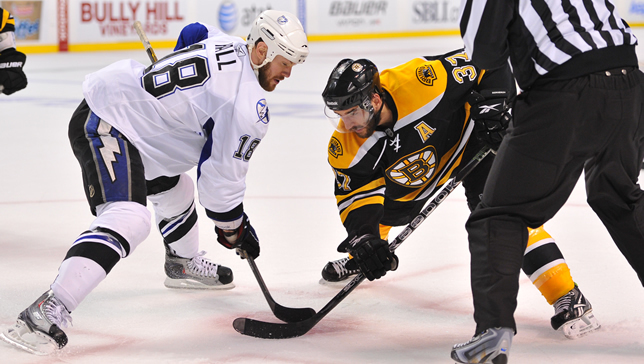 He led the Lightning in face-off percentage with 55 percent and ranked fourth overall with 360 face-offs won. Hall also led the team with 152 hits and was third among forwards with 59 blocked shots. He was Tampa Bay’s nominee for the Bill Masterton Memorial Trophy after battling his way back to the NHL in 2010-11. He was one of four Bolts to play in all 82 games. The 30-year-old veteran also played in all 18 Stanley Cup Playoff games with the Lightning as they made it to within one game of the Stanley Cup Final. He recorded a goal and five points during the postseason. A native of Kalamazoo, Michigan, Hall has played in 508 NHL games with the Lightning, Pittsburgh Penguins, Minnesota Wild, New York Rangers and Nashville Predators. He has amassed 63 goals, 136 points and 28 power-play goals during his career. After being signed by the Bolts as a free agent prior to the 2008 season, Hall has gone on to notch 12 goals and 28 points in 156 games in a Lightning uniform. He has also played in 49 career Stanley Cup Playoff games, recording seven goals and 13 points. This past season was his first appearance with Tampa Bay. Drafted in the second round, 52nd overall, by Nashville in 1999, Hall captained the U.S. National Team Developmental Program’s U-18 team in 1997-98 before embarking on a four-year career at Michigan State. With the Spartans he recorded 64 goals and 126 points in 159 career games, and he served as captain his senior season. Hall was named to the CCHA All-Tournament Team (2000-01), the All-CCHA Second Team (1999-00) and the CCHA All-Rookie Team (1998-99).